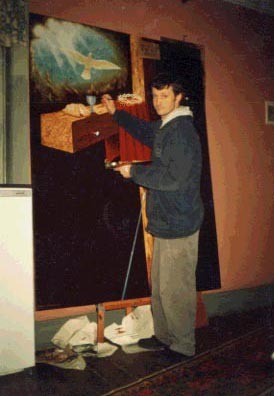 When I visited Portugal some years ago, Norton Da Silva Pastor of Agua Viva Igreja Crista, commissioned me to paint a picture for the church - which can be seen in the photo below with me painting the picture. Since being commissioned to produce the picture of the Cross for Agua Viva Igreja Crista church, Coimbra, Portugal. I completed a number of versions on this theme, above is one of the last ones I did which includes the world at the foot of the Cross.